The Middle Ages, or Medieval Period, covered one thousand years of human history, from the fifth to the fifteenth century. It was a time of feudalism, superstition and the rise and fall of kingdoms. It was also a time when Christianity was primarily represented by one established Church, ruled by the Pope in Rome, who oversaw a vast empire of bishops and monks, nuns and monasteries. The Roman based church dominated the religious and political lives of everyone from peasants to royalty. Women were, by law, subject to male relatives and for the most part confined to domestic duties. As women could not join the priesthood their only avenue into a spiritual vocation was to become nuns. Despite the times and circumstances in which they lived, there were women we know about who stood out for their leadership skills, spiritual gifts and courage. (There was no doubt many more whose names we may never know.) 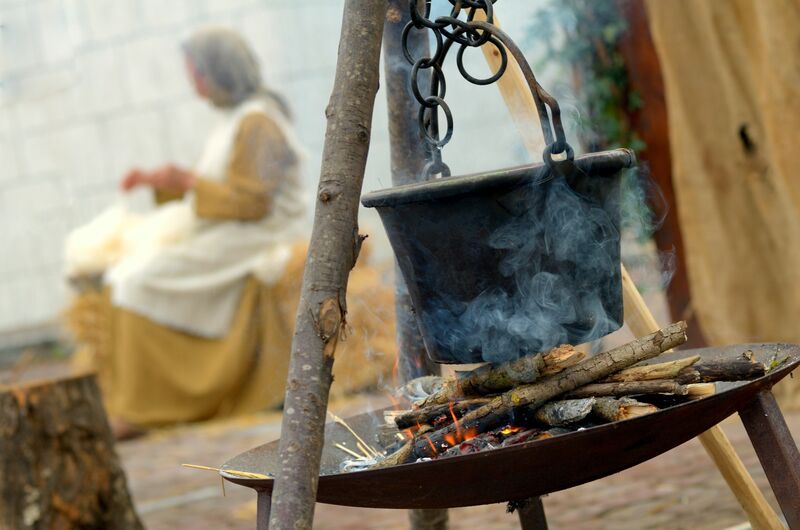 Here are some brief insights into the lives of just a few of these outstanding Medieval Christian women. Lioba was born in England at the beginning of the 8th century, though the precise date is uncertain. As was often the case with female children, at an early age she was sent to live in a monastery under the care of the Abbess of Wimborne. There she excelled in her studies, and demonstrated exceptional skill in the understanding of scripture. Lioba is said to have had a dream in which purple thread came out from her mouth continuously as she wound it into a ball. Seeking understanding she consulted an older, prophetic nun who told her the thread signified the wisdom with which she would teach and give counsel throughout her life. In 748 Lioba was summoned by the famous English monk, Boniface, to Germany to help with his missionary work. Taking 30 other nuns with her she set up a convent in Bischofsheim where they began to convert the local people as well as setting up a girls’ school and providing charity to families in the area. Boniface trusted her with a great deal of authority and before long Lioba was asked to set up several new monasteries across Germany. Such was Lioba’s reputation for wise leadership and kindness soon community leaders were seeking her out for advice and counsel. She eventually became an advisor at the royal court where she was well respected and influential at the highest levels. Her influence was such that even bishops consulted her, granting her permission to enter monasteries where women were normally forbidden. Several miracles have been attributed to Lioba, including calming a storm and a number of healings. She died in September 782 and is remembered for her gifted evangelism, wisdom and kindness. Hildegard was born in the Rhineland region of Germany in 1098, the tenth child in her family. From an early age she experienced visions, although she did not make this known until much later in adulthood. At age eight Hildegard was placed by her parents in the care of the reclusive nun, Jutta, who became her friend and mentor. For many years Hildegard kept quiet about her visions, confiding only in Jutta. When Jutta died in 1136 Hildegard was elected by her fellow nuns to lead their community. Hildegard moved her small community of nuns to a new town where they could function more independently of priestly control. 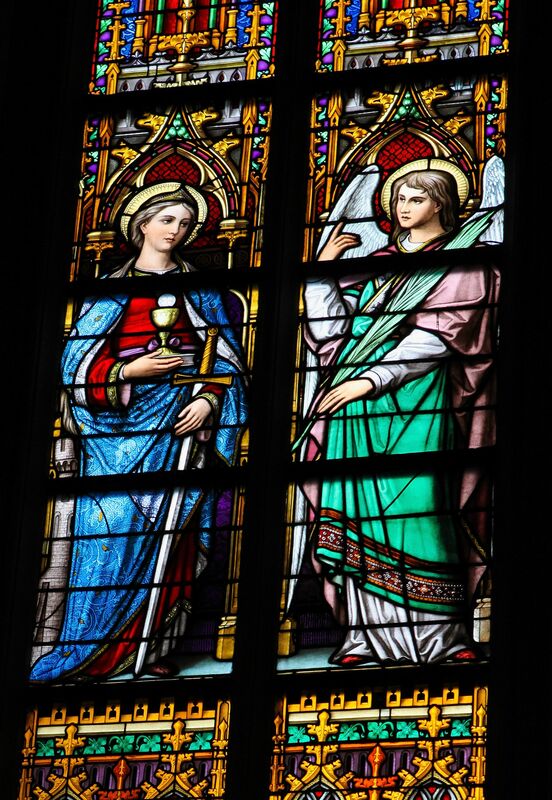 In 1148, after news of Hildegard’s prophetic gifting somehow reached the Pope, she was granted papal permission to record her visions as true messages from the Holy Spirit. After this Hildegard began officially documenting her visions, ideas and thoughts, initially producing three volumes of visionary theology. She composed several musical compositions to be used in worship, two volumes of material on herbal medicine, a gospel commentary, and several other written works. She also invented an alternative alphabet which it is thought she used to communicate to the nuns in her care. Hildegard lacked formal education and was unable to write well, but overcame this by using scribes to record her many academic works. In her later life she became a renowned Abbess, preaching publicly in great cathedrals of Europe as well as in the monasteries she oversaw. She conducted at least four preaching tours throughout Germany where she spoke to both clergy and laity. At a time when women were generally held in such low regard, Hildegard wielded significant influence among the civic and church leaders of her day, including the Pope. She is remembered as an outstanding preacher, theologian, composer, linguist and botanist. Hildegard died in September 1179. Her musical compositions are still recorded and performed to this day. The Lollards were a breakaway group of Christians who thrived between the years of 1382 and 1435 and whose origins can be traced back to John Wycliffe. Considered heretics by the established Church, they believed the scriptures should be translated into the language of the common people and made available to all, not just the church hierarchy. They objected to many of the practices of the Church of the day including professional priests, celibacy, veneration of relics and icons, rule by a Pope, and prayers for the dead. At a time when teaching and preaching was the exclusive domain of ordained male priests, the Lollards welcomed women and encouraged them to preach. Most Lollard preaching was done house to house and in the streets of villages and cities, though there were some dissenting church and community leaders who opened their pulpits to them. For their radical views the Lollards were severely persecuted by the established Church and many were tried and executed for heresy. Records survive detailing the trials of two Lollard women preachers, Hawisia Mone and Marjery Baxter, in the English city of Norwich between 1428 and 1431. The home of Hawisia and her husband Thomas was a centre of hospitality, fellowship and Bible study for the Lollards and also the venue for a Lollard school. For this they were both put on trial for heresy. Hawisia’s testimony of her beliefs reveal, among other things, she believed: “that confession should be made only to God, and to no other priest, for no priest has power to remit sin, nor to absolve a man of any sin.” No information is available concerning any official punishment for Hawisia. Another Lollard woman teacher, Marjery Baxter, was brought to trial on the accusations of a villager, Johanna Clifland, with whom she had shared her beliefs. According to her trial records, Marjery, in challenging the medieval practice of venerating crucifixes, spread her arms wide and cried out: “this is the true cross of Christ, and you ought and can see and adore that cross every day here in your own house”. Marjery was apparently sentenced to four Sunday floggings, a relatively light sentence for the time, considering many Lollards were hung, burned, or both. Many of the beliefs for which the Lollards were persecuted formed the seeds of the great Protestant Reformation that rocked Europe and England a century later. Julian was born about 1343 and lived during a time of great suffering and upheaval in Europe when the main focus of the Church was hunting out and executing heretics. Her lifetime spanned significant historical events including the great plague, the inquisition, the Hundred Years War between Britain and France, peasant uprisings and persecution of religious minorities such as the Lollards and others. Little is known of Julian’s earlier life before she became an anchorite. Anchorites were women who dedicated their lives to God and withdrew from the world, choosing to live out their days as recluses in small rooms attached to churches which they never left. They would receive food and basic necessities through a window which was usually their only view into the outside world. Julian, who described herself as ‘a simple creature, unlettered’, was an anchorite living in the churchyard of St. Julian’s Church, Norwich (UK). It is doubtful that Julian was her actual name and more probable that she took the name of the church to which she had attached herself. Prior to becoming an anchorite, when Julian was thirty years of age, she fell gravely ill and was not expected to survive. During her illness she is said to have received fifteen divine visions, and a sixteenth upon her recovery. She recorded the visions and subsequently spent the next twenty years reflecting on them. Sometime around 1390 Julian began collating these visions in a book entitled Revelations of Divine Love. It is the first known English language book written by a woman. Julian’s great focus was the love of God. She believed God loved everyone and desired all people to be saved, a theory that was highly unpopular among the clergy of the time who taught that the plague and other adverse events were God’s rightful punishment on sinners. In one of her visions Julian describes seeing God holding something resembling a small brown nut in His hand. It appeared so fragile she thought it might crumble but she came to understand that what He was holding was the entire created universe. She then heard: “God made it, God loves it, God keeps it.” For this reason she is sometimes depicted in art as holding a small walnut in her hands. Julian became well respected as a spiritual authority throughout England and died in 1416. Her writings remain to this day and she is remembered as one of England’s most important mystics. Yes, Virginia, these women are very inspiring. And while we hear so much about the ‘church fathers’ and other male Christian leaders (inspiring and otherwise) throughout history, we hear so little about our female forebears. There are so many more than I have briefly mentioned here! 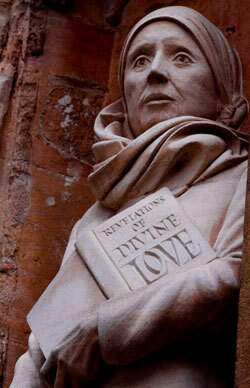 Thanks, beautiful article, found Julian of Norwich , when I was sick and hurt so bad I could’t get out of bed. Blessings come from many places. We have a rich spiritual (female) heritage. Isn’t it marvelous that God is no respecter of persons! Glad He saved these records to represent so many who served Him.